Not all Hawaiian brunch pop-ups can make it to brick-and-mortar status. Not all Hawaiian brunch pop-ups seamlessly add dinner and lunch to the lineup. And not all Hawaiian brunch pop-ups add a tasting menu at the chef’s counter. 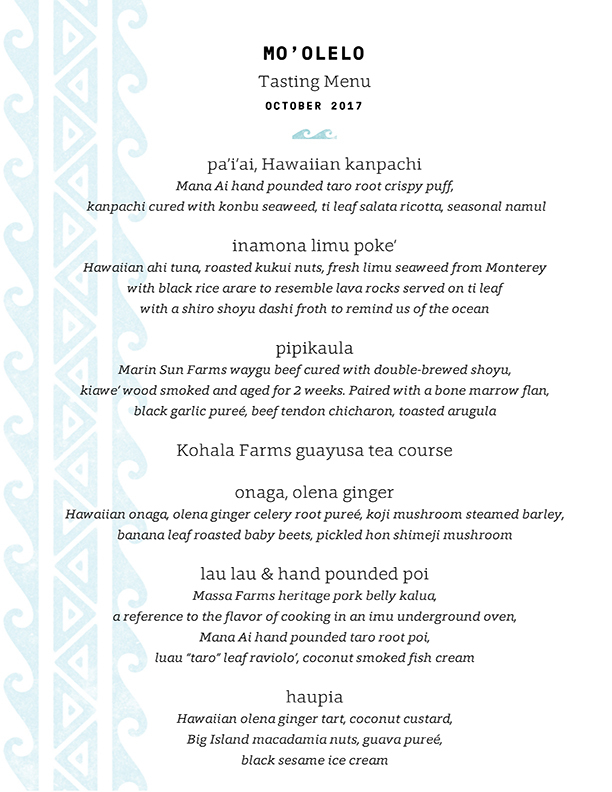 But ‘aina has proven that its transition to permanent neighborhood restaurant is the natural extension of chef Jordan Keao’s natural ability to educate diners on Hawaiian culture, while deftly delighting them with flavorful, authentic food. “It’s what you’re serving,” says Keao. “Even if you’re a corner mom-and-pop.” The addition of a tasting menu to his low-key Dogpatch restaurant is Keao’s opportunity to get face time with his customers, sharing stories of the food and its origins. Six seats at the chef’s counter serve as the epicenter for his menu, titled mo’ olelo, which roughly translates to story, or legend. Six courses serve as the story, offering insights into Keao’s cultural tale for $60, a veritable bargain in San Francisco’s esoteric world of tasting menus. Keao says the restaurant could charge more, but they’d be able to reach fewer people with the menu; eventually the chef wants to extend the prix fixe option to the entire dining room. To do that, Keao has upped his intake of specialty ingredients from Hawaii, which he admits adds more expense on both ends. However, the tasting menu format allows the chef to spread out the cost of pricey ingredients like poi, pounded taro root that Keao has shipped in from an organic, sustainable farm in Hawaii throughout the menu, keeping the price low. The menu is a blend of specialties from different regions, though mainly focusing on Keao’s native region. “I’m cooking with the food and flavors of Hilo, which are up mountain on the east side on the big island. It has a lot more Japanese and country influence, like cowboys.” Though Keao’s personal history is based in Hilo where Japanese influences are prevalent, Hawaii’s vast cultural landscape includes contributions from China, the Philippines, and more. A dish on the menu, pipikaula, is a mix of those influences, featuring Marin Sun Farms wagyu cured with double-brewed shoyu, that’s been smoked with kiawé wood and aged for two weeks; it’s served alongside bone marrow flan, a black garlic puree, beef tendon chicharrone, and toasted arugula. “The tasting menu allows us the time to tell the story and educate diners on the culture of Hawaii. I’m cooking from the memory of being a kid,” says Keao. As a result, the tasting menu’s story is complex: It tells the story of a place whose culture has strayed from tradition, and is inundated with outside, processed food. This is his contribution to the movement growing in Hawaii, as locals shift from shopping at Costco to buying local products once again. “Hawaii was not raised on rice. Hawaii was raised on poi.” As a result, the restaurant soon won’t be serving rice on the dinner menu at all, though it will remain at brunch. The tasting menu launches November 10, though reservations for the chef’s counter are now available on Resy. Two seatings, 6 p.m. and 8 p.m., are available for $60; optional beverage pairing is $20.